Planning on getting a kitchen renovation makeover? Don’t fret if you’ve got a small kitchen. Work with what you’ve got and maximise the space you have. Here are some kitchen designs to help you maximise your space and make it appear bigger and more spacious than it actually is. Glass panels help lighten the look of the cabinets and allow the eyes to travel back, making the room seem more expansive. This would be more effective if all the items inside the cabinets are organized and colour-coordinated; a cluttered and disorganised cabinet will make the room seem smaller. Check out this kitchen designed by Weil Friedman Architects for inspiration. If you want to add a little more flair to your kitchen, rethink getting bigger kitchen accents. Geometric and vertically striped walls or floors add just as much character but will draw your eyes forward along the lines, making it seem like the room is longer or taller than it actually is. 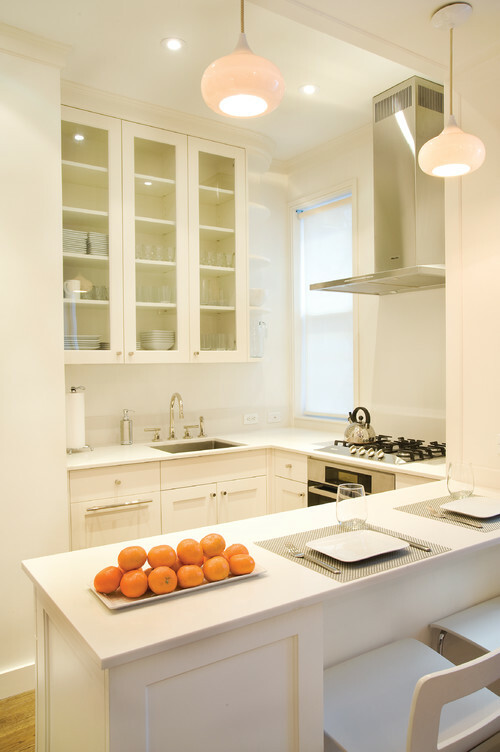 Choose kitchen accessories and fixtures that do not obstruct the line of sight and reduce visual weight. Shop for backless bar stools, wire kitchen islands, and glass pendant lights which are just as chic but minus the bulk. A skylight will open up the ceiling and visually expand the space. Having large windows will also create a more open feel around the room. Balancing this natural light with some ambient lighting will surely provide the same feeling during the night. 6. Shiny surfaces can also do the trick. When shopping for kitchen appliances and furnishings, you can opt for stainless steel appliances, glossy floors, glass tiles, and sleek cabinets. These work similar to mirrors that reflect light strategically. 7. Consider maximising the room’s layout. If the kitchen is connected to another section, such as the dining area, you can borrow space by cutting walls and make it seem that the other room is a natural extension of the kitchen design. You can also consolidate the appliances, for example, putting the cooktop and oven in the same area to save counter space. You can also build the appliances into the cabinetry to prevent clutter. Thinking of a kitchen renovation project? Talk to our team and we will provide customised recommendations to help you change the look of your small kitchen and transform it into a more functional and visually appealing room. For bespoke small kitchen designs, trust Badel Kitchens and Joineries, the leading experts in kitchen makeovers in Sydney.